Two people have been arrested after a fast food delivery driver in Peterborough was robbed at knifepoint. 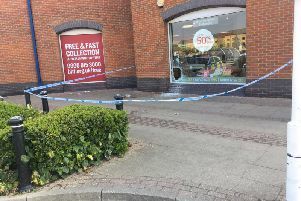 It is the latest shocking attack on a takeaway delivery driver after police revealed three further robberies had occurred in little over 48 hours last week. The latest incident saw the force called just before midnight last night (Tuesday) to attend Danes Close in Eastfield. Three teenagers, two aged 18 and one aged 17, were all arrested nearby and are currently in custody. Previous incidents include a robbery at about 10.35pm on Thursday (April 11) in Eastholm Close, Eastfield Road. Other attacks occurred in Holmes Way, Paston, at about 2.20am on Saturday (April 13) and in Dunstan Court, Eastfield, at about 12.35am on Sunday morning (April 14). In the first three incidents victims delivering food were attacked by a group of men who made off with the food and cash. A 26-year-old man from Peterborough was arrested in connection with those incidents and has now been bailed to return to Thorpe Wood Police Station on April 29.